It seems that the delivery service industry will finally pull itself out of the list of 3D (dirty, dangerous and difficult) industries and that couriers who deliver parcels from dawn to dusk will become a part of the past. The era of automated parcel sorting has come! 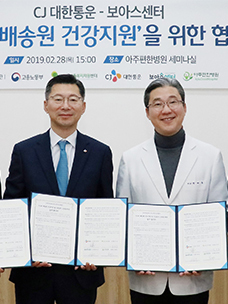 Korea's No.1 delivery service provider CJ Logistics (CEO Park Guen-Tae) is investing 122.7 billion won in establishing an automated sorting process for its sub-terminals throughout the nation. To this end, the company decided to install a wheel sorter, which it developed jointly with a domestic SME in all of its sub-terminals across the nation. A wheel sorter is a system that automatically sorts parcels on the conveyor into designated areas. Currently,CJ Logistics operates over 200 sub-terminals across the nation, including over 100 in the capital area, and the company is planning to install the system one by one from this October to April 2018. 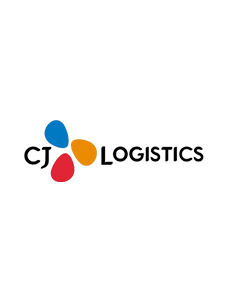 CJ Logistics is currently operating one mega hub terminal in Daejeon, four hub terminals and over 200 sub-terminals. The company's five hub terminals are already sorting parcels through automated sorting systems, and the company commenced automating the 200 sub-terminals this time. It is the first time in the industry to automate the sorting process of all the sub-terminals, and the company will become the first to complete full automation of the entire sorting process along with its already automated hub terminals. Moreover, automating sub-terminals will result in a huge change in delivery service spots and customer service. In the domestic delivery service process, a sub-terminal is a place where couriers gather in the early morning, sort parcels from the conveyor to find ones for their designated areas and load them on their vehicle and depart. As the delivery service industry grows, the amount of parcels has also grown, requiring a longer time to sort parcels. If CJ Logistics succeeds in automating the sorting at sub-terminals by introducing the wheel sorter, the scene of delivery service spots will make a dramatic change. First, the time taken to sort parcels before departure will be dramatically reduced by around one hour. This means that couriers can get to the sub-terminal around 9:00 am and depart at 10:00 am. As they may return to the terminal for second delivery when the amount of parcels is large or may collect returns or carry out sales-related activities for the owners of goods, they are likely to see improved profitability. In addition, as delivery departure time will be shortened by more than 2 hours, customer service will be improved as well. CJ Logistics expects that improved the working conditions for couriers will lead to improved customer services, which, in turn, will increase the volume of parcels and the ensuing profits of couriers, forming a virtuous cycle. The automation project in which the company will invest a total of 122.7 billion won will begin from the capital city in October and expand to other regions one by one in the order of metropolitan cities and then the other regions and is expected to fully complete by April 2018. In addition to this, upon completion of the mega hub terminal in Gwangju, Gyeonggi Province, in which the company invested 400 billion won and is due for completion by June 2018, the entire sorting process from hub terminals to sub-terminals will be fulfilled. Furthermore, the company's advanced systems that are under development, such as the automated parcel unloading system, the truck safety accident prevention automated control system, and the drone and automated driving robot, are all in line with the National Logistics Masterplan defined by the Ministry of Land, Infrastructure and Transport that seeks to develop smart logistics technologies combining logistics with advanced technologies and is expected to contribute to advancing the delivery service industry. The company plans to develop advanced technologies based on AI and IoT and apply them to its delivery service. For example, under such technologies, couriers may be able to check the address, product and requests of customers through a voice-recognition device without having to check the waybill. In particular, CJ Logistics has conducted R&D with domestic small equipment manufacturers since last year to introduce automated sorting systems. 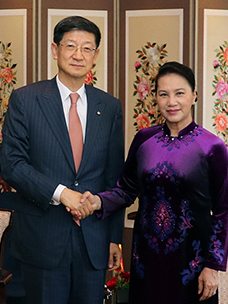 Given that most of the automation systems used in Korea are imported ones, this move is evaluated to have killed two birds with one stone, both fostering domestic SMEs and creating national interest. Park Geun-Tae, CEO of CJ Logistics said, "We decided to invest in the automation of sub-terminals in order to improve customer services by improving the working conditions and profits of couriers and also to follow the commitment of our Chairman Lee Jae-Hyun to changing logistics, which is recognized as a 3D industry, into a smart industry by introducing advanced innovation technologies." "The founding philosophy of CJ Group is that businesses should continuously make investments to create jobs and contribute to the national economy even despite the economic recession." Meanwhile, the total amount of CJ Logistics' investment in its delivery service from delivery integration in 2013 to this automation project is amounting to 1 trillion won. While many businesses are avoiding making investments due to the ongoing economic recession, CJ Logistics remains aggressive in its investment strategy.